The lion makes for an ideal symbol of royalty because, after all, the lion is the king of beasts. And on the Regal Lions Leather Arm Bracers, the lion has never looked kinglier. With these bracers, you can wear this long-standing symbol of royalty. This item features a pair of regal lions that have been engraved onto a pair of hand-crafted leather bracers. The bracers themselves are made from high-quality leather, either from tough 13/15 oz. leather or flexible 7/8 oz. leather. Both are ideally suited for making bracers that are sturdy, strong, and comfortable. Two rampant lions face each other, hind-legs secure on the ground with their paws raised and ready for battle. Both wear crowns to signify their authority over the animal kingdom. The lions are, in fact, a mirror image of one another, reflected across the middle-line of the bracer. 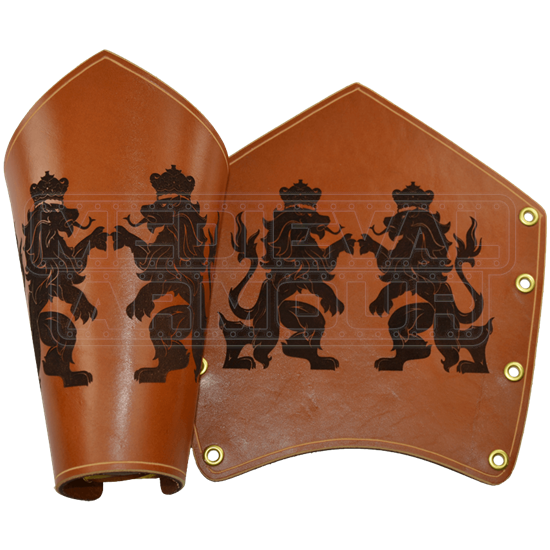 Eyelets line the left and right side of the bracer, where the supplied leather lace can be threaded through and pulled tight so that it will remain securely yet comfortably on your forearm when you wear the bracer. You may not be royalty or king of anything like a country, but in the Regal Lions Leather Arm Bracers, you will feel like a king, all the same.